Blizzard has confirmed that there will be hireable mercenaries in Diablo III, but they’ve not given any details yet. Even if they had, and at this early stage the feature is very much subject to change, and player suggestions can make a difference. So, how do you think mercs should be handled in Diablo III? Should they be removed from the game entirely, returned much as they were in Diablo II, or changed radically? That issue is discussed and many questions and speculations regarding Diablo III mercs are asked, later in this column. First, let’s refresh our memories about Diablo II mercs, and their pros, cons, and balance issues. Look below to read the full article, and join the conversation at the bottom of that page. How a player uses their mercenary is a major strategic factor in Diablo II. Mercs can be given headgear, body armor, and a weapon, and how powerful they are is greatly affected by their equipment. Most players derive a lot of benefit from their merc, but they are more beneficial to some builds than others. There are a variety of types of mercs in D2, with different strengths and weaknesses, and different mercs work best with different play styles. In practice, 99% of players get an Act Two merc with Might or Holy Freeze in Nightmare, and stick with him forever. Casual players don’t always use mercs, don’t often use them well, or lack the wealth (in equipment) to load up a merc in top quality gear. Rich players know how powerful mercs are and possess enough gear to turn them into killing machines. A really well-equipped and buffed merc can devastate regular and boss monsters (though all mercs have trouble with act bosses, since they suffer a damage penalty and a huge damage-taken bonus). Mercs are useful for much more than their own killing power, though. The auras they share to the group are very useful, and rich players who equip their mercs with items that grant auras can add enough bonuses to simulate a multiplayer game. Largely as a result of the auras, those inherent to the mercs and on equipment, lots of experienced D2 players feel mercs are way overpowered. How powered they should be is open to debate, but anyone who remembers what it was like playing a Bowazon or Sorceress in D2C, before mercs with Holy Freeze were available has some appreciation for how helpful a hireable tank can be. (Most Bowazons now use Might mercs, but that’s due to other game changes (cold damage on everything, Elite bows with huge damage, etc) rather than Holy Freeze losing its effectiveness. Part of the original game design and strategy was based on which characters could summon their own tanks. For instance, sorceresses have no tank skills, and that adds a lot of difficulty to the character. D2C sorceresses had to play fast and furious, always moving to avoid enemies and lead them into killing zones. Most of that strategy went away once sturdy hireables were introduced. Taking all that into account, and allowing for some disagreement over just how overpowered mercs were, how can hireables be improved in Diablo III? Players have discussed this issue at length in a variety of forum threads; this one prompted many of the questions I’m asking in this column, so check it out for background detail. 1) First of all, a more basic question. Should there be mercenaries at all, in Diablo III? As touched on above, having or not having a tank is a major strategic issue in an RPG like Diablo III. I got to play the Wizard and the Witch Doctor at Blizzcon in October, and at least in the early going, the Witch Doctor was far easier than the Wizard, despite having much less powerful skills and less mana. Why? Because the WD had Mongrels to summon up and use as tanks. Standing behind them, my WD was able to scorch and poison monsters without taking any personal risk at all. The wizard, despite having far more powerful spells, had to constantly run and dodge and fight while retreating, since she had no one and nothing to tank for her. One thing that happens when there are no mercs is that players are encouraged to play with each other. A wizard, at least in the early going, will be vastly more effective and powerful when playing with a Barbarian or some other character who can tank. If there aren’t mercs, or they are weak, wizard players will have a much easier/better time playing with other players. On the other hand, this could be argued as a feature that’s almost forcing Wizards to play in a party, and is therefore denigrating the single player experience. 2) Assuming there are mercs, how powerful should they be? This is a complicated question, since it’s hard to get the balance right. Mercs were basically a novelty in D2C, since they didn’t have enough killing power or survivability, and couldn’t use auras. Then came D2X and the mudflation of items it brought along, and suddenly Mercs were invaluable. Should mercs be just strong enough to assist players, but not so strong they can make a major difference in killing power? If they’re too weak, no one will hire them. If they’re too strong, they’re unbalancing. Another factor is the fact that strong mercs make weak character builds more viable. Players who want to experiment with non-uber, non-cookie cutter character types can put their best equipment on their merc and let him (or her) do most of the work. Would weak mercs therefore reduce character variety? 3) Speaking of balance, how can mercs be implemented so they give equivalent bonuses to all characters? Some D2 builds have little need or use for mercs. Others find them essential. This is more about the builds than the mercs, though. 4) Can there be a variety of mercs of equivalent value? The D2 team had a good idea making a different type of merc in each act, but the creativity was undone by poor balancing. 6) Finally, would assessing higher costs for merc maintenance be a way to balance them? Or would it just make the rich richer? Mercs could cost gold over time, or randomly take some of the gold or items found, but this might just make poor players unable to afford them, while rich players didn’t even feel the sting. Answering this one requires some speculation, since we don’t know much about how the end game economy will operate in Diablo III. If gold is truly a valuable, useful commodity, then making mercs cost gold to operate, rather than just a one-time payment to hire, could be an important factor. 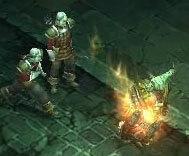 Let us know what you think about how mercs should (or should not) be implemented in Diablo III. This is an issue the D3 Team is working on right now, and your thoughts might be of value to them.